This week I’ve done my most thorough meal plan yet. 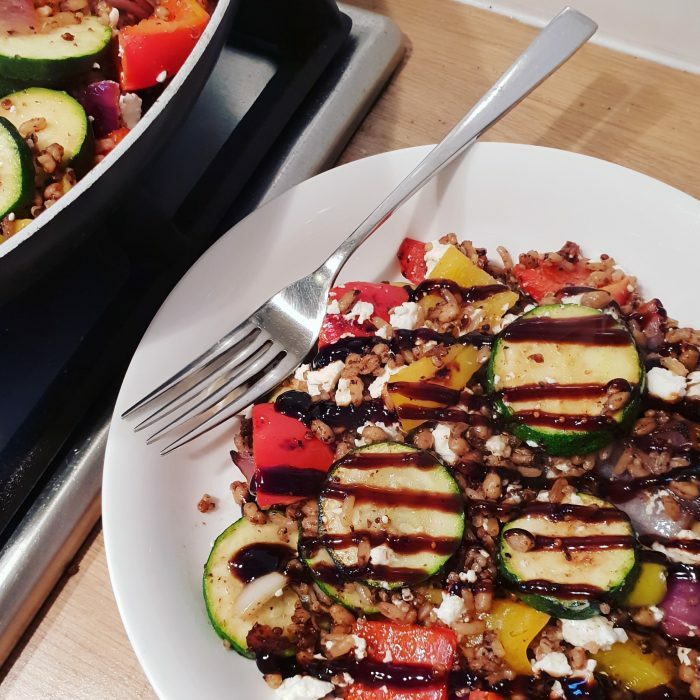 I wanted to focus on how much I’m really spending on the meals I prepare for my family and see if I could make all of our evening meals for less than £3 per family meal. Keep reading to find out exactly how much each meal we’re eating cost! My plan was to spend as little as possible and use the money that I came in under budget to buy things to go in the food bank collection. Over Christmas the local collection point was overflowing with donations, since the new year every time I look it’s practically empty. I don’t really do new year’s resolutions but this year I want to start buying at least one extra thing each week with our shopping to donate. I’ve shared before how things are tight financially in our house. I only work 2 days a week so I can be home with the kids and we have to live within a tight budget to get by. We don’t have savings or much disposable income so one expensive emergency could literally break us. And yet compared to some we are so so lucky. We are able to feed our family and have the occasional treat, we have a roof over our heads, clothes on our backs and for that I am grateful. There are so many people who worry about where their child’s next meal will come from or have to sacrifice their own meal so their children will eat. Putting a little something extra in the food bank will barely make a difference to us but it will make a big difference to someone who needs it. I urge everyone else to just buy one thing to donate next time you go shopping too. What did I get for the food bank? 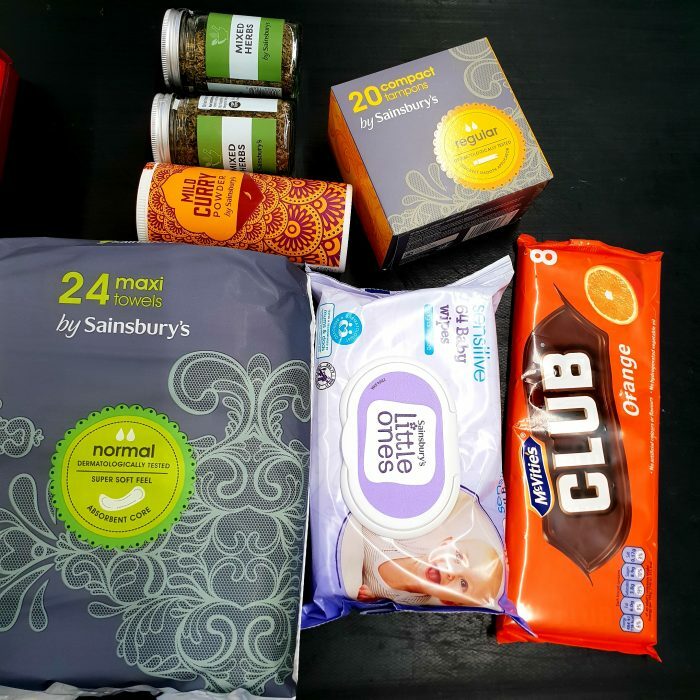 This week I got some baby wipes, sanitary towels, tampons (it’s that time of the month and the thought of not being able to afford the most basic essentials makes me so sad so it seemed appropriate), a few tubs of mixed herbs, some curry powder (who says inexpensive food needs to be bland?) and and a packet of biscuits. All paid for with the money I saved by shopping savvy. If you use one of the meal ideas from my meal plan and save money doing so please consider using a little bit of it to buy something to help someone else! For breakfast we will be eating cereal, porridge or toast. The kids love Aldi hoops and at 75p a box it will last them the week. They always have a piece of fruit too. 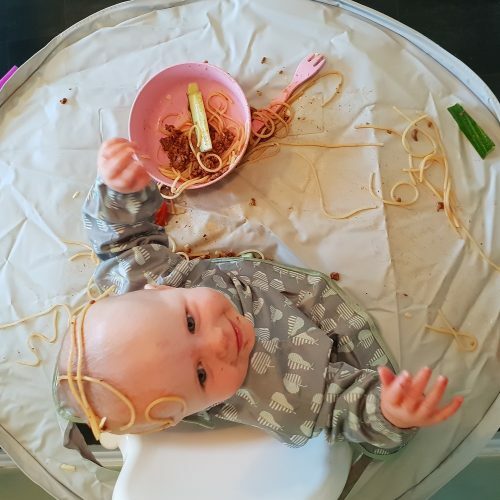 Harry has packed lunches at school so usually a sandwich or a wrap with some fruit and veg sticks, yoghurt, hard boiled egg, raisins, that kind of thing. Megan tends to have similar at home. I like to have couscous or quinoa salads with lots of veggies. You can get the packets really cheap in Aldi and one pack usually makes 2 lunches for me. I’ll also have leftovers for lunch some days. 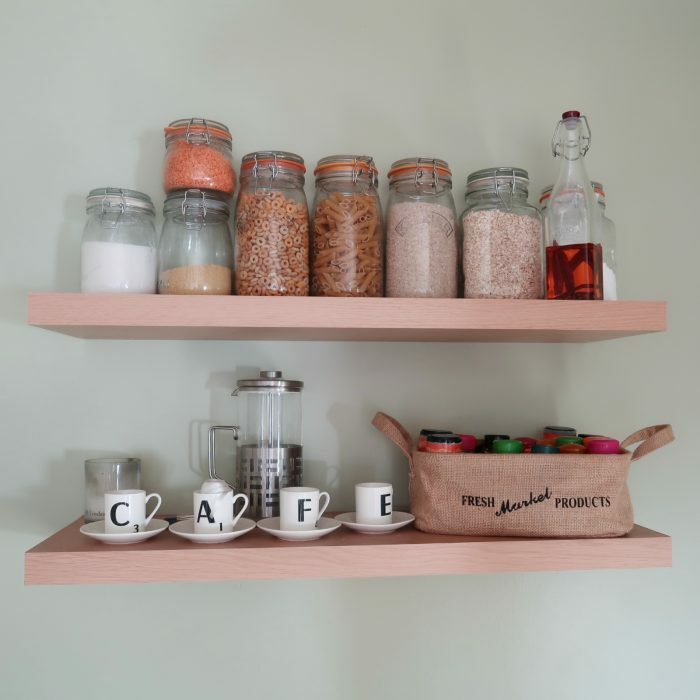 Reducing waste is my best tip for saving money! My dinners this week are the meals I’ve put the most thought into. I’ve added up how much each meal costs to make (which wasn’t easy after 5 hours sleep) and figured out how much I’m spending on feeding a family of 4 in the evenings. Chicken and chorizo paella – 53p per portion, £2.17 for the 4 of us. I’ve bought a whole chicken from Aldi which will make 2 evening meals and leave some meat left for lunches too. Chorizo is a great way to add lots of flavour to a meal without needing to use a lot of it so that’s my plan with this one! 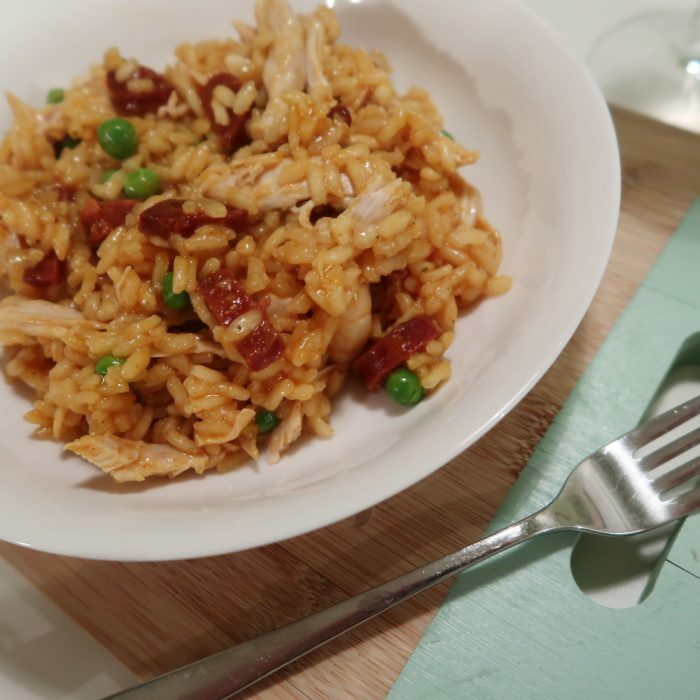 In an ideal world you’d use paella rice however whatever rice you have will do just fine! We made this tonight when arborio rice so I guess technically it’s a risotto… I have no idea but it tasted amazing and that’s what matters! 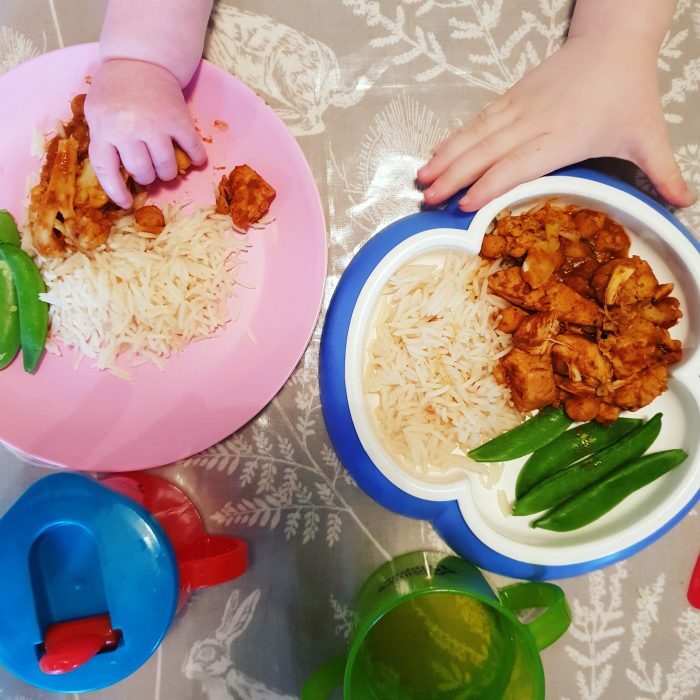 Chicken curry – 51p per portion, £2.02 for the 4 of us. I’ll bulk this out with chickpeas and make our own sauce to keep costs down. You can find the recipe I use here. The kids love this one. It’s so quick and easy to make and we use any leftover batter mix to make pancakes with fruit and chocolate spread for pudding! Sausages freeze really well so we tend to buy them on offer and pop them in the freezer until we want to use them. I’m going to add bacon to this for extra flavour and serve it with frozen peas. I LOVE frozen vegetables as a way to save time and money! I’ll pad this out with lentils and veggies to make it stretch even further. This usually makes enough for 2 meals for us all so I’ll freeze the other half. I’ve halved the cost above so it reflects just what we will eat in that one meal. Turkey Burgers with homemade wedges – 69p per portion, £2.74 for the 4 of us. I make these myself and they are so easy and cheap to do! 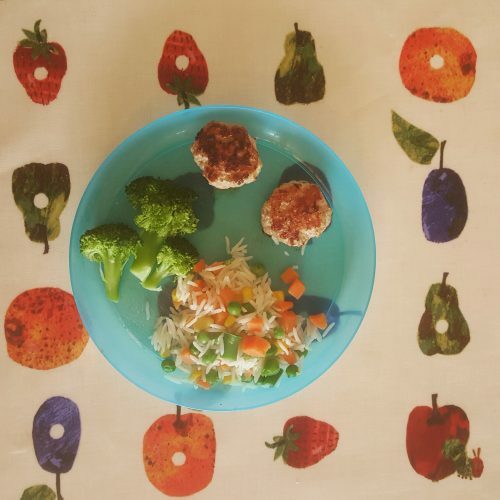 Turkey mince is really inexpensive and perfect for burgers! The recipe I use is here. 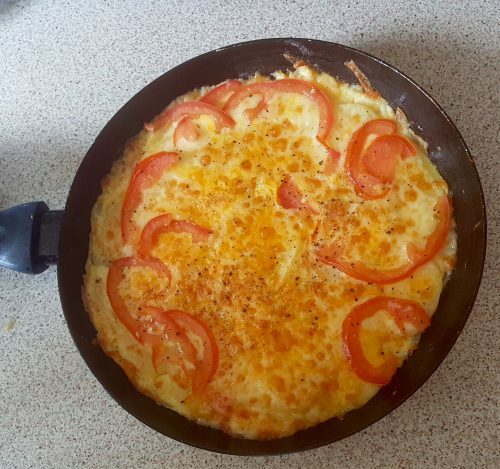 My kids love a good omelette. It’s so quick and easy to throw together. Every meal plan needs a lazy meal like this! Let me know if you want any of the recipes for the meals featured in my meal plan! 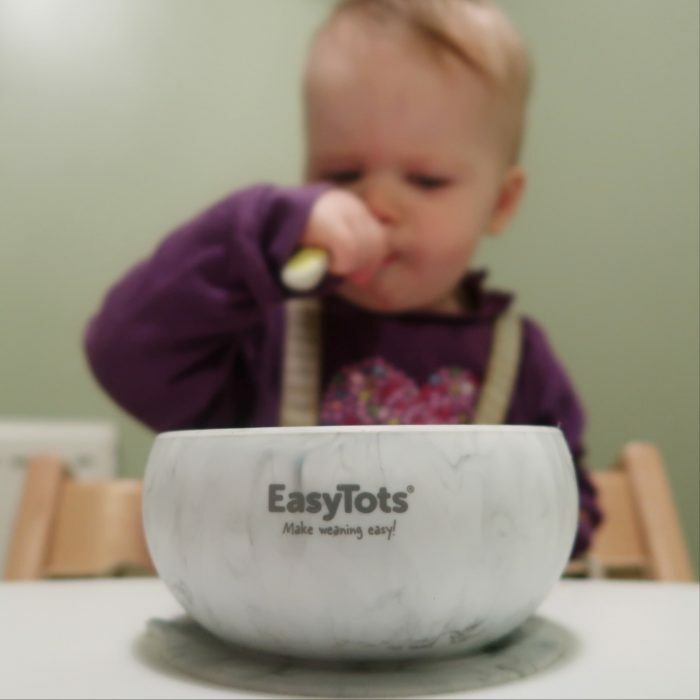 What are your top tips for feeding your family on a tight budget? I’d love you to share! I would love the recipe for slow cooker Mac and cheese.